As the name would imply, the Omec have awoken. In small groups, they filter down to Earth to help Kindzi usher in her reign of terror. With Yewl’s unwilling aid, they begin to gather their strength, feasting on the innocent people of Defiance. This is not an episode for the squeamish. Meanwhile, Stahma tries to make peace with Alak now for fear Kindzi will soon hunt her down, inadvertently endangering him and Luke in the process. I can’t say I particularly enjoyed this episode, though I’m not entirely sure why. I guess you could chalk it up to my general disinterest in the Omec. Or perhaps I’m getting a little tired of death, gore, and horror after an entire season of it with no real relief. There are some obvious flaws in “The Awakening,” as well, though nothing too egregious. For instance, I felt Amanda’s breakdown was rather out of character. Not unjustified, but still out of character. After the way she chewed up and spit out Pottinger, I can’t believe she’d just give up like that. Also, the situation with Alak feels contrived. He’s so worried about Kindzi, but he seems in no rush at all to leave. One odd theme of this episode: Agreeing with characters I don’t normally agree with it. Stahma is right — this whole mess is entirely Amanda’s fault. She was warned repeatedly about what would happen if she allied with the Omec, and she just didn’t listen. And even more shockingly, I agree with Berlin — Irisa’s plan of trying to make peace with the Omec is foolish. I will nerd rage so hard if they try to redeem the Omec. The entire point of their arc to date is that they are really just monsters, and “The Awakening” has only reinforced that. T’evgin was the only halfway decent one, and he was still brutal, arrogant, and unforgivably callous. 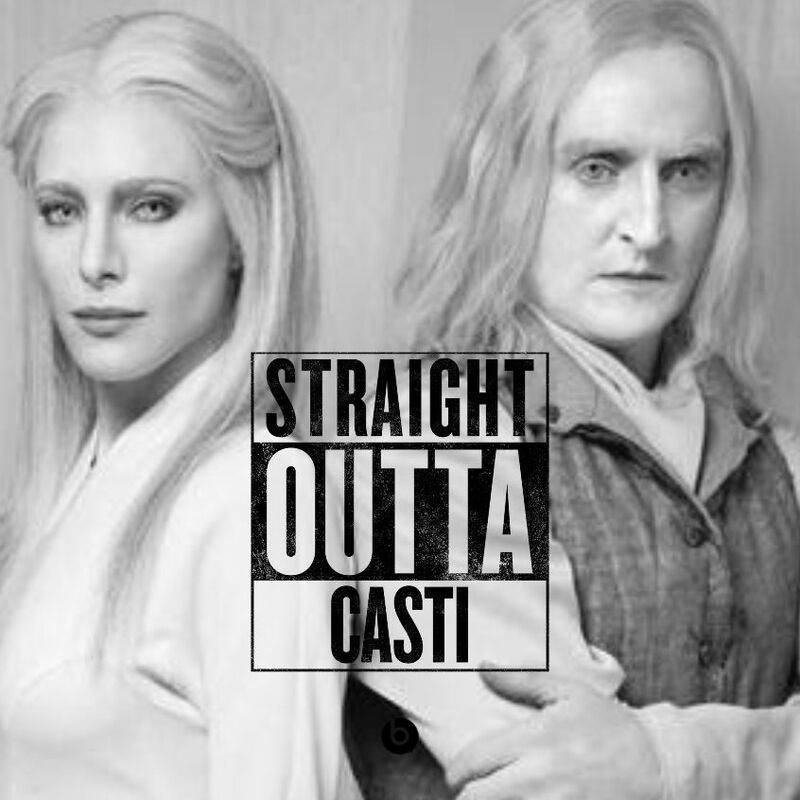 There are two highlights to this otherwise mediocre episode, though, and it will surprise no one familiar with Defiance that their names are Datak Tarr and Meh Yewll. I don’t even want to spoil anything. They’re just awesome. I was quite surprised a Google search turned up no other versions of this. I once heard Raymond E. Feist describe his books as “ripping good yarns.” I viewed this as his way of saying that his books are less about expressing some deep message or being the height of artistry and more just about providing fun and excitement. 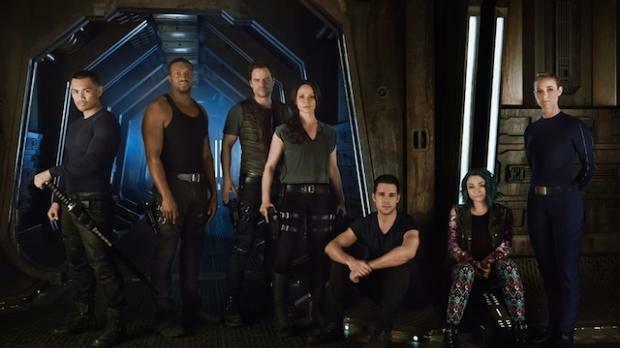 The eleventh episode of Dark Matter is a ripping good yarn. Picking up immediately where episode ten left off, episode eleven shows the crew of Raza hopelessly under the thumb of Waxler and his ruthless band of mercenaries. The show takes some time to remind us that yes, these are really awful people. One takes the worst of it, but nobody is exactly enjoying themselves. I’m not sure how much I should say about the latter half of the episode. I generally try to avoid spoiling things in any major way. On the other hand, while it’s a very fun twist, it’s one that could easily be seen coming, to the point where half of the fun of the episode was waiting for it to happen. What I will say is that it is a very fun, action-packed episode, and very satisfying after the tension of the last episode. This is also another case of Five taking a more active and heroic role than usual, which makes me very happy. In general, this is an episode that will likely please the feminists among us. I think they’ve atoned for that awful fembot episode now. I have a couple complaints, but they’re very minor and don’t significantly detract from how entertaining episode eleven was. The first is that we still don’t have much more insight into the true nature of the crew or how they got into this situation. I think we’re rather due for an info dump. Certainly I was expecting one. I’m also a little underwhelmed that One’s speech didn’t ultimately amount to anything. As Six said, it was a good speech. Then again, if the guys had done more, it would have detracted from Five and such. So maybe it’s not such a bad thing. 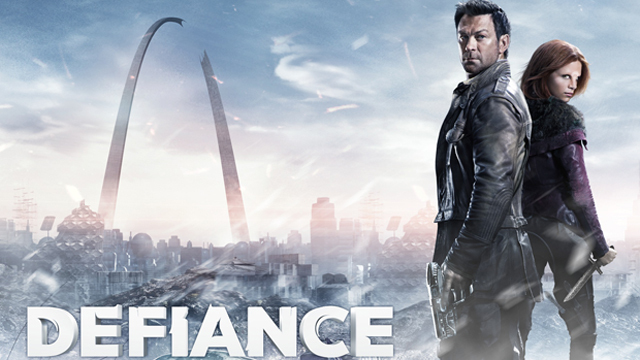 This entry was posted in Games and tagged Dark Matter, Defiance, review, sci-fi, TV by Tyler F.M. Edwards. Bookmark the permalink. Loved both episodes, though I have to agree that Amanda’s breakdown was out of character for her. Loved the scene with Yewll when they pulled the control stem and she’s all “No it’s nothing, really ,just leave it alone omigod that hurts so bad stopitstopitstopitstopit. . . . . . Oh thank god.” She just nailed the tone of that perfectly. i also liked that Datak pointed out that the OMec simply don’t have the numbers to do much more than cause a bit of chaos before being wiped out, so Kindzi really should re-think her plan. T’evgin had the right of it — coexist or die really seem to be the Omec’s only options. T’evgin chose to co-exist, and Kindzi’s choosing to die. And as you and Six say — One’s speech really was good, if ineffective. Yeah, that scene with Datak was probably the highlight of the episode, and he is absolutely right. 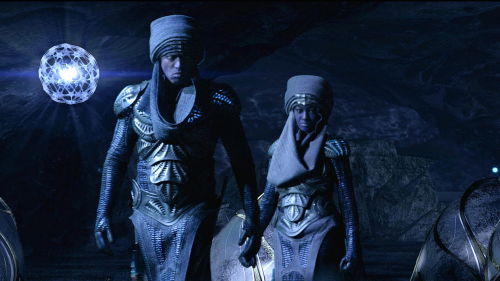 Powerful though the Omec are, they cannot hope to defeat all of humanity and the Votanis Collective. Kindzi can survive a bullet to the head, but can she survive being carpet-bombed by a stratocarrier or sucked into one of those blackhole bombs Pottinger had?